If you’ve had similar experiences as I, you may have found how oftentimes in prayer, either public or private, people change their voices and stretch their words, as if talking to some unknown, powerful being a million light years away. Their voice may fluctuate and they may sound as though they were giving a speech or trying to convince God to do something. This, is not to be defined as prayer. Prayer need not be just some mystical, super spiritual activity. Simply put, prayer is a conversation between a Father and His child. Have you ever noticed how a child comes and talks to his mom or dad? You never need to look for a dictionary to find out the meaning of the words children use. They come just as they are. They come simply. You will never find a child getting into a frenzy and fluctuating his voice as he talks. All you will hear is a small voice, in simple conversation, looking up into the mom’s or dad’s eyes. One of the most wonderful experiences anyone is when you are able to hear your child praying. In Matthew 18:3, Jesus turned to the disciples gathered around Him and taught them an important lesson: “Amen I say to you, unless you be converted, and become as little children, you shall not enter into the kingdom of heaven.” The way a child prays, in simplicity and trust, is the perfect portrait of prayer. When we look at the prayer of Jesus in John 17, we find the same picture. We are told that “Jesus, lifting up his eyes to heaven, said: Father ”. If you’ve had similar experiences as I, you may have found how oftentimes in prayer, either public or private, people change their voices and stretch their words, as if talking to some unknown, powerful being a million light years away. Their voice may fluctuate and they may sound as though they were giving a speech or trying to convince God to do something. This, is not to be defined as prayer. Prayer need not be just some mystical, super spiritual activity. Simply put, prayer is a conversation between a Father and His child. Have you ever noticed how a child comes and talks to his mom or dad? You never need to look for a dictionary to find out the meaning of the words children use. They come just as they are. They come simply. You will never find a child getting into a frenzy and fluctuating his voice as he talks. All you will hear is a small voice, in simple conversation, looking up into the mom’s or dad’s eyes. One of the most wonderful experiences for me was when I was able to hear my daughter at the age of 4 or 5 praying. In Matthew 18:3, Jesus turned to the disciples gathered around Him and taught them an important lesson: “Amen I say to you, unless you be converted, and become as little children, you shall not enter into the kingdom of heaven.” The way a child prays, in simplicity and trust, is the perfect portrait of prayer. When we look at the prayer of Jesus in John 17, we find the same picture. We are told that “Jesus, lifting up his eyes to heaven, said: Father ”. Through this example, Jesus was showing us that prayer is simply talking to God— not just as the almighty Creator of the universe, but as the caring, loving Father who waits for His child to come, a Father who delights to be with His children. Come Just as You Are to the Father. We have need to remember this through out the day. So easily we can forget that the Father loves us just as He loved Jesus. Then, instead of coming to Him because of who He is, we are kept at bay, consumed more with who we are or are not. The enemy has a number of tactics to keep us from praying because he knows that it is the greatest way for the Church of God to expand. He also understands how our hearts and perspective on the situations of life are changed through prayer. 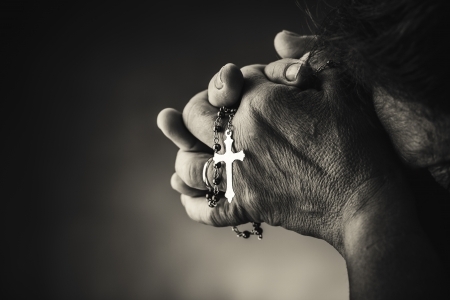 Are you one who truly desires to pray, yet when you do, you are soon bogged down with all the ways you fail, remembering how you aren’t matching up to the spiritual person you want to be, until eventually all motivation to pray is lost in guilt. “And rising up he came to his father. And when he was yet a great way off, his father saw him, and was moved with compassion, and running to him fell upon his neck, and kissed him. And the son said to him: Father, I have sinned against heaven, and before thee, I am not now worthy to be called thy son. And the father said to his servants: Bring forth quickly the first robe, and put it on him, and put a ring on his hand, and shoes on his feet: And bring hither the fatted calf, and kill it, and let us eat and make merry: Because this my son was dead, and is come to life again: was lost, and is found. And they began to be merry." (Luke 15:20– 24). For we have not a high priest, who can not have compassion on our infirmities: but one tempted in all things like as we are, without sin. Let us go therefore with confidence to the throne of grace: that we may obtain mercy, and find grace in time of need. (Hebrews 4:15– 16). So then, let us pray, remembering who it is we call Father and realizing that prayer is coming to Him and listening to what He has to say. Prayer is waiting before Him and meditating long enough in His presence until our hearts are touched and moved with His concerns and burdens, so that we become channels for Him to work through. Prayer is our willingness to say no to our own desires and accept suffering in the flesh, to experience the pain and agony the Lord feels for the events and people in our lives. Prayer is our willingness to join with Christ in the Garden of Gethsemane and experience His pain and heartbreak for a world that is lying in utter darkness, plunging into eternity to perish forever. Prayer is standing in the gap on behalf of the needy and hurting, asking the Father to heal and to save before it is too late. May we be inspired this week to spend quality time with our Father in prayer.